When life gives you a good sale on seasonal pumpkin spice chips, you create your own recipe in which to use those chips. At least, that’s what I do, because my mind is weird like that. Tollhouse Pumpkin Spice Chips are mildly spicy and smooth. They work really well with this ultra-smooth dough, that includes melted white chocolate mixed right in. 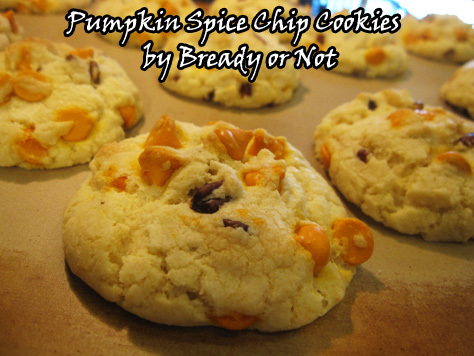 I borrowed that foundation of the recipe from my White Chocolate Macadamia Nut Cookie recipe. These cookies gain enough crisp to be solid, but they are still chewy. The chopped pecans (or whatever nut you want to throw in) add nice flavor, but more than that, they add texture. They cut the sweetness some. If you see these special chips on sale at Target or elsewhere, grab’em! You now have the perfect recipe to use them in. 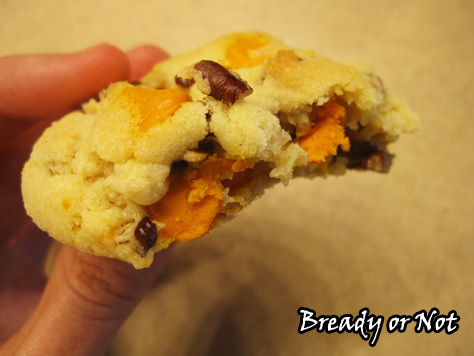 This chewy cookie recipe uses special seasonal Nestle Tollhouse Pumpkin Spice Chips to bring a mildly spicy kick to this white-chocolate smooth dough. Preheat oven to 325-degrees. Place 1 cup of white chocolate chips in a microwave safe bowl. Microwave on 50% power in short increments, 20-30 seconds, and stop to stir between passes until the chips blend smoothly. Be careful--white chocolate can burn fast! Set aside to cool. In a large mixing bowl, beat together the sugar, butter, vanilla, and eggs until they're creamy. Mix in the melted chips. Stir in flour, baking soda, and cream of tartar. 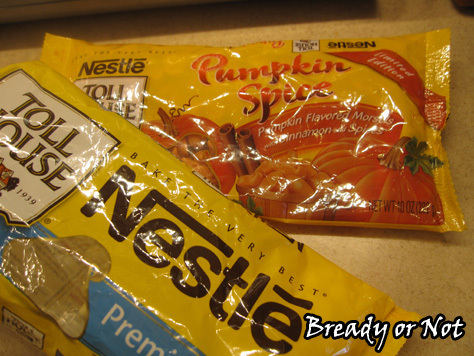 Add the pumpkin spice chips and the pecans. 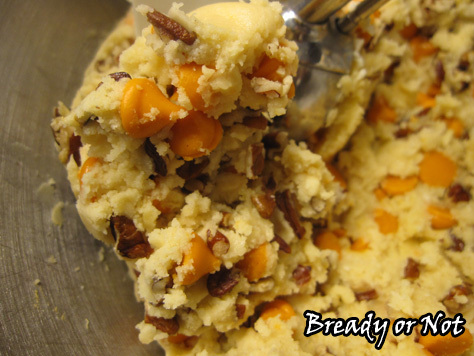 Use a cookie scoop or tablespoon to place dough in rounded lumps on cookie sheet. Bake 10 to 12 minutes, until the edges begin to turn very light golden brown. Cool on the sheet for several minutes, then move to a rack to cool. 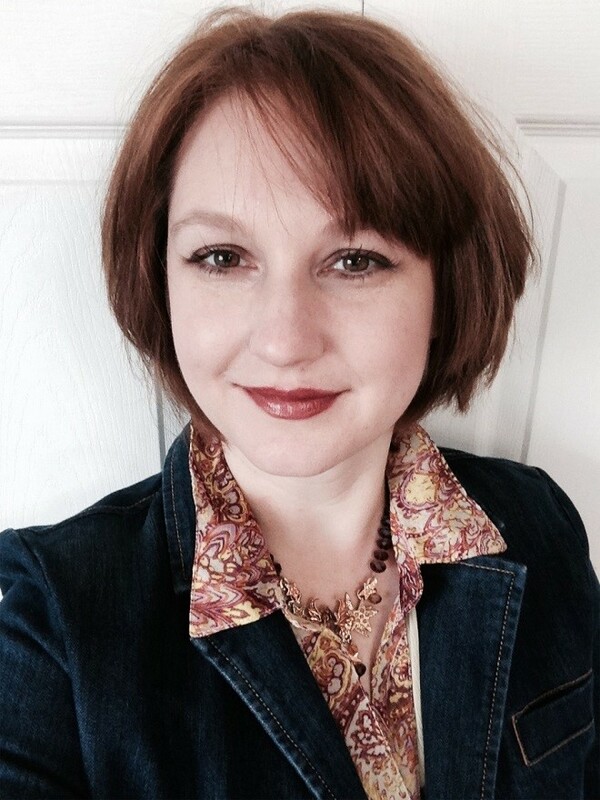 Today I welcome fellow Harper Voyager Impulse author Laura Bickle. Her latest book, Mercury Retrograde, is out today! The first book in the series is Dark Alchemy. Both sell for just $2.99. Laura’s going to provide some great advice for writers on how to manage time… not time to write, but the timeline of events within your story. Writers tend to get into a lot of trouble with time. There’s making time to write, managing deadlines, and the vagaries of market timing. One issue with time, however, is entirely within the author’s control. And that’s the timeline of the story. I never paid a whole lot of critical attention to time when I read. Sure, I was conscious that some passages in stories could be languid and slow-moving like a drippy faucet. Others were exhaustingly rushed. I never was quite able to put my finger on why. And then, when my first book was accepted for publication, I discovered the answer: books can grow timeline issues. They’re very subtle, but can really cause problems with the reader’s perception of a work. A timeline problem occurs when characters have too many events crammed into a period of time – or not enough. A succession of tasks emerges that would require the bending of the rules of the space-time continuum or superhuman abilities to accomplish. It occurs when your main character hasn’t slept for days. It happens when she travels an impossible distance in an hour. It can take place when your main character hasn’t worked regular hours at her day job without explanation. This goes for crazy amounts of overtime, or not working at all. It happens when your character is doing “cop stuff” for seven days in a row without a day off or at least a pro forma request for overtime. It’s easy for an author to lose track of what day it is, and a character can get trapped in a month-long weekend or a year of Wednesdays. Mundane concerns? Maybe. But they catch an editor’s eye and seep into the subconscious of the reader. And sometimes, we’ve gotta pay attention to the rules of the real world – like time – in order to allow the reader to suspend disbelief for the really magical things we want to do with the story. My first editor asked me to turn a timeline in with my book. Something simple, listing the day, night, and all the scenes that happened in each. By reviewing my manuscript in this way, I could see where I crammed too many activities into the heroine’s day – or (eep!) not enough. When I finish a draft, I read through it and start constructing my timeline. I also create a second list that’s not strictly a timeline. It’s one that notes where chapters begin and end, how many scenes are included in the chapter, and how many pages each chapter is. Sticking a ten-page chapter next to a twenty-five page chapter creates unevenness, and keeping a note helps me be more aware of it. It also shows me where I have a bunch of stubby two-page scenes strung together. This causes me to question whether I’m head-hopping or whether I really need to find a way to collapse those scenes into less choppy ones. It helps me analyze flow. It also shows me whether I’m doing a good job of ending chapters in the middle of the action, causing the reader to want to turn the page to the next. By doing this kind of post-hoc analysis, and correcting the results, I found that pacing issues automatically ironed themselves out. I’ve turned a timeline in for every book since, whether or not I was asked. And it’s really reduced the amount of time I spend fixing structural issues in revisions. Now, I tend to work with that timeline in my head, and it keeps me honest. It keeps my very human characters from turning into Wonder Women and Supermen. Not only do I have to manage time, but my characters do, too. Maintaining a timeline is a front-line editing fix I suggest that every writer keep in the toolbox. Laura Bickle grew up in rural Ohio, reading entirely too many comic books out loud to her favorite Wonder Woman doll. 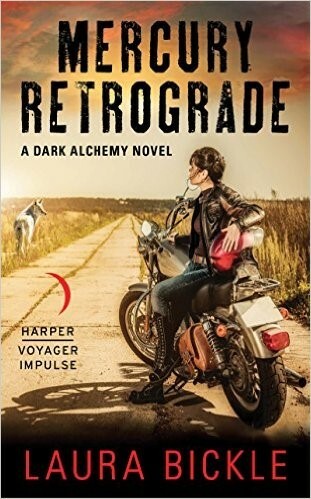 Her most recent novel is MERCURY RETROGRADE (Harper Voyager Impulse). The latest updates on Laura’s work can be found at www.laurabickle.com. 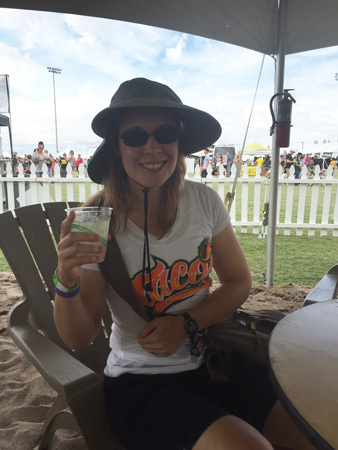 Last weekend I made my annual pilgrimage to the Arizona Taco Festival. It was glorious! I have a full write-up over at the Holy Taco Church. At Novelocity, I share Five Not-Horror Books to Creep You Out for Halloween! If you’re in the mood for dark fantasy, check these out. Fear seems to be something of a theme right now… it’s just that time of year! I’m in an SF Signal Mind Meld on The Children’s Movies That Scared Us the Most and I was also interviewed by Pat Esden (who has a forthcoming Bready or Not guest spot) about Real vs Imaginary Fears and Wings of Sorrow and Bone. 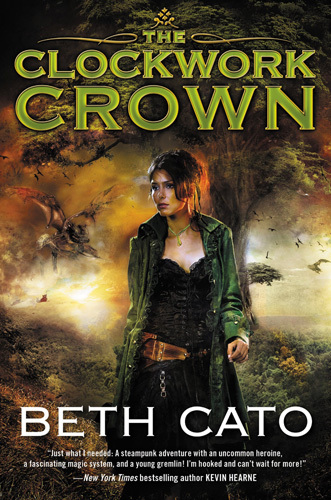 In totally different non-scary news, Reb Kreyling posted a wonderful review of Clockwork Crown! Yay!